Frangipane, according to my Larousse Gastronomique. is a pastry cream made with butter, eggs and almonds, with multiple variations in ranges of complications. It was named for a 16th-century marquis who had a thing for almonds. I call it another word for love. 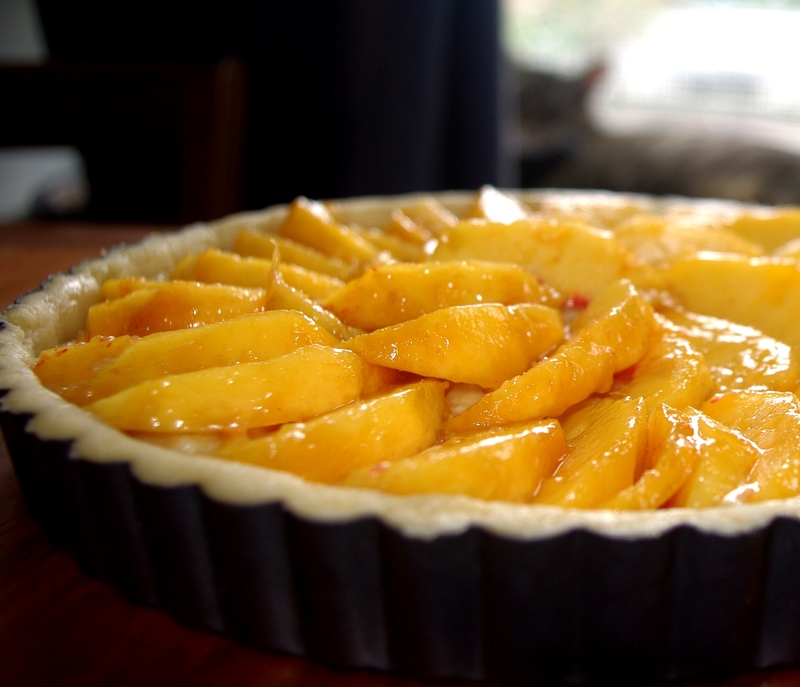 Covered with fresh stone fruit–in today’s case, nectarines–frangipane is a luscious foil for the last, best gasp of the summer harvest, quick enough for a steamy August day and decadent (and impressive) enough to feed a neighborhood pot luck. At the same time, it is hearty enough to ease us into and transition through the bittersweet (at least for me) season of fall. Starting with the Gourmet recipe for an apricot fangipane tart, I made frangipane (a half cup of butter whipped with 1/3 cup of sugar, a couple of eggs, a cup of almond flour and a hit of vanilla), then spread it into an unbaked paté brisée (shortbread) tart shell and topped with sliced, fresh nectarines. Forty minutes in the oven (350 degrees) and a quick caramelization turn under the broiler: TART! Easy, pretty, delicious. It might be the end of summer, but it isn’t the end of flavorful, fruity foods.